For many people, the first thing that draws them toward bird ownership is a parrot's beautifully colored feathers. Whether you're looking for a red, green, or purple parrot, this bird species offers plenty of variety. Brightly colored plumage isn't the only trait that a prospective parrot owner should consider before adoption. You also need to think about whether the bird's nature is a good fit for your lifestyle and home. The Eclectus parrot is one of the few sexually dimorphic parrot species. This means that the females and males look distinctly different from each other. Males display a rich green color with red accents, while the females have red and purple feathers. 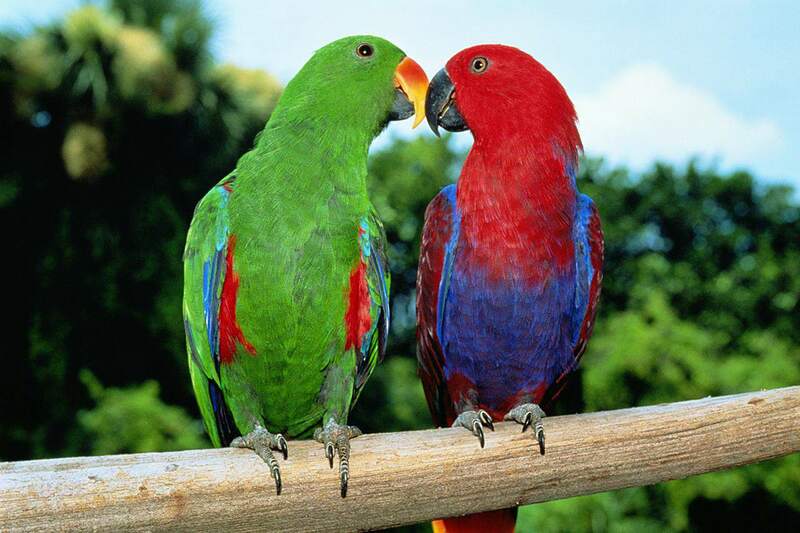 As with all parrots, Eclectus parrots need special care and attention in order to thrive. Sun conure parrots have nearly the entire rainbow on their bodies. These captivating birds have red, yellow, and orange on their heads, chests, and wings. Those colors are offset with a green and blue tail and flight feathers. These birds are also among the loudest parrot species around. Before adopting a sun conure, make sure you (and your neighbors) can handle the noise. Scarlet macaws are big, beautiful parrots with red, yellow, and blue feathers. Their beauty can be very tempting for someone looking for a pet parrot. But it's important to consider more than their striking looks. These are large birds that require a great deal of space, time, and attention. Before adopting a scarlet macaw, be sure that you know what you are getting into. They can be loud, messy, moody pets that demand a lot from their owners. Rose-breasted cockatoos are pink, gray, and white birds with charming personalities. Their colors may be more subdued than some other parrots, but that uniqueness also makes them very attractive. Like other cockatoos, however, these birds are sensitive. They require calm, patient owners who have a lot of spare time to spend with their pets. Blue and gold macaws, as their name implies, display a bright blue and yellow plumage over most of their body. They also have accents of rich green. Perhaps one of the most recognizable parrot species, blue and gold macaws can be high-maintenance for any owner. This is particularly true during adolescence when they can get aggressive. Like most Amazon parrots, the lilac-crowned Amazon is green over the majority of its body. The deep lilac feathers on the tops of their heads, coupled with the prominent red blaze on their foreheads, help to make these birds a highly sought after Amazon species. 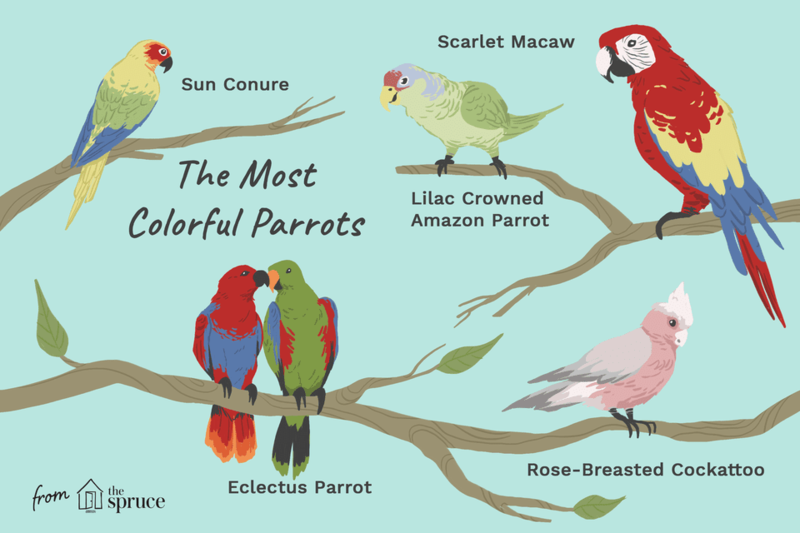 Like all Amazon parrots, these birds have strong personalities. They will need a lot of attention and interaction with their owners. In addition to being one of the most brightly colored, Hyacinth macaws are the largest parrot species known to man. Their owners claim that they're also among the most gentle, loving, and affectionate parrot species. However, they're definitely not the ideal pet for everyone. Hyacinth macaws have a reputation for being very sensitive birds. For the bird's health, it's important to give them a calm, loving environment in order for one to thrive as a pet. A hybrid macaw is something of a "wild card" as far as colorful parrots are concerned. By cross-breeding macaws with different color traits, breeders have come up with a nearly endless array of colorful macaws. Of course, this has drawn both fans and criticism from the bird-owning community at large. No matter what your stance is on whether or not it's right to breed hybrid parrots, you're sure to appreciate the beauty and diversity in a hybrid macaw's plumage. They are a macaw, though, and require the same space and attention of any large parrot. Blue crown conures are another of the most recognizable parrots. They have a rich green color with bright blue heads. Like most conures, they can be quite loud. They also need a significant amount of social interaction with their owners, just like all parrots. Strikingly similar to the scarlet macaw, greenwing macaws are an excellent choice for those who want a vividly colorful pet parrot. With a mostly bright red body, these birds display bright stripes of green and blue on the backs of their wings. Greenwing Macaws are also considered "gentle giants" of the macaw family. Though they are very adamant—if not obsessive—about craving attention and affection from their owners.